Lillie Leonardi, a former police officer who retired from the FBI due to post-traumatic stress disorder linked to her role in the aftermath of the Sept. 11 terror attacks has written a book about seeing legions of angels guarding the Pennsylvania site where a hijacked airliner crashed. She served as a liaison between law enforcement and the families of the passengers and crew members killed in the United Airlines Flight 93 crash. She arrived on the scene about three hours after the crash. 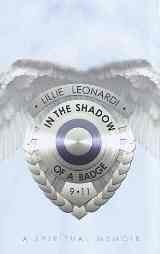 Leonardi's book, "In the Shadow of a Badge: A Spiritual Memoir," centers on her vision of angels. “There were angels standing in the open area to the left of the crash site. There were hundreds of them standing in columns. There was a field of angels emerging from the realms of the mist. They were Archangels with their wings arched up toward the sky,” she explained. “And I didn’t say anything to the guys because you can imagine if I would have said, ‘I just saw angels on the crash site,’ they’d have called the office and they’d have said, ‘She lost her mind and tell her to go home’,” she wrote. I learned about In the Shadow of a Badge last night and look forward to reading her book. On the anniversary of that tragic day, we remember those who lost their lives and the loved ones they left behind. May God's angels enfold our hearts to extend love and peace and strength to all.